For some birds, love is in the air. When a pair of White-throated Swifts wants to get to know each other, they meet up — on the wing — high above the ground. The birds grasp one another and, clinging together, tumble downward, for over 500 feet. Just before striking the earth, they separate, flying nonchalantly back up the canyon wall. 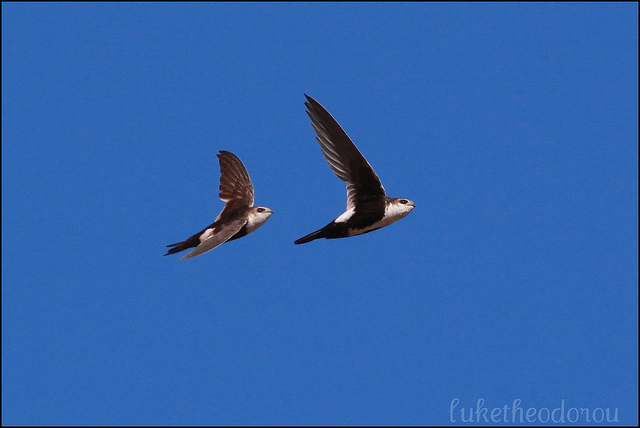 Visit a Western canyon, and you might see a pair of swifts literally falling in love. This is Cupid’s busiest day of the year. * You could say that love is in the air. And for some birds, you can take that literally: love really is in the air. This behavior, known as a courtship fall, helps bond the two swifts as a pair for the nesting season. Some observers suspect that White-throated Swifts may even mate during their rapid, joint descent. Elvis Pressley Can’t Help Falling In Love from The Essential Elvis Pressley album, Sony 2007. Bird sounds provided by The Macaulay Library of Natural Sounds at the Cornell Lab of Ornithology, Ithaca, New York. Calls of White-throated Swifts  recorded by M. Lammertink.